Blog readers have different expectations of web content than they would with a novel or an essay. Instead of large blocks of text, they’re likely to expect small chunks of content that can be skim-read for the information they want. We’ve already covered some of the best practices for formatting content, but what else can you do to grab your audience’s attention and keep it? Appealing to readers on the web doesn’t mean you can’t write a long blog post. It just means you need to present your content in a manageable format. A good way to start is to look at your sentence length and paragraph spacing. Have a look at these two examples, from our blog about telling your story in the digital world. Which would you rather read? To make things even easier for skim-readers, you could present key points as items on a list. Try to make each point similar in length, and format them consistently. Numbered lists should only be used when it makes sense to order your points – for example, if you’re writing a ‘Top 10’ list or a series of step-by-step instructions. You can also use a numbered list to structure the content of your blog. This format works well online, as it offers a specific promise to the reader, and sets clear expectations of what they can gain from the content. So, for a blog about SEO, the title ‘4 easy steps to start ranking in Google’ could be more appealing than the broader title ‘Start ranking in Google’. Another effective way to draw attention to the most important points in your content is to use bold text. This could be helpful for highlighting the products or services you offer. Our bookkeeping service is tailored to the needs of your business. We can also handle payroll, saving you valuable time and resources. Bold text is usually your best option for emphasising phrases in this way, as it’s easier to read than italics and not as intrusive as capital letters. It’s also best to avoid underlined text, which often looks like a hyperlink. Don’t get too carried away with bold text, though. The trick is to use it sparingly – if you only bold the most significant text, it’ll stand out much more against the rest. An image or infographic can break up your text, and make longer content more visually appealing. Images will also make your content better for social media sharing. Not only will this spread your message to a wider audience, it will also offer that audience a link back to your website. This, in turn, is good for your search ranking. If you’re happy to adopt an informal tone, animated GIFs can be a light-hearted addition to your written content, showing a more human side to your brand. 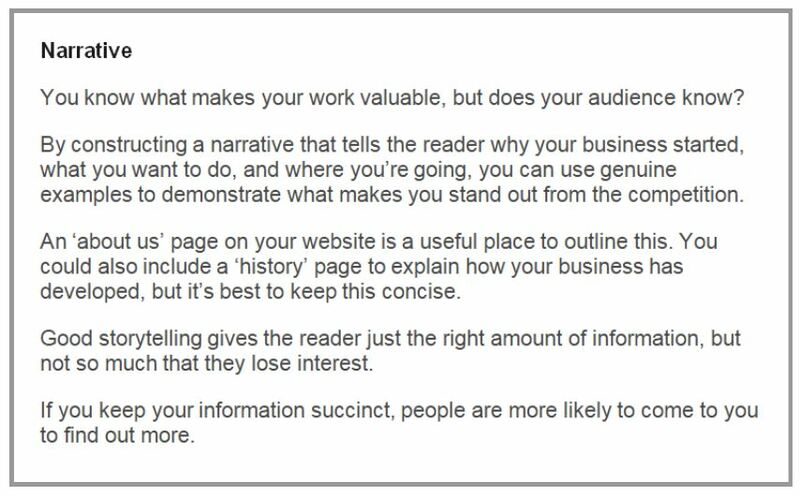 As with any of these tips, it’s always best to use your judgement and keep your audience in mind when deciding how to present your content. Not sure how to set out your content? We’re happy to help. Get in touch for more advice on writing for the web.